Lamisil cream represents an innovative approach to the topical treatment of diverse infections disease of the skin and subcutaneous tissues. The health product is characterized by high effectiveness in most patients, great tolerability, low rate of reported side effects, and gentle curative action. The main active ingredient of the cream is terbinafine. This chemical substance belongs to the group of allylamines and has a wide range of antifungal effects. Even comparatively low concentrations of this active ingredient provide a significant fungicidal effect on most dermatophytes, as well as dimorphic fungi. The effect provided by the drug on the development and/or reproduction of yeasts, depending on their species, may be fungicidal and/or fungistatic. The drug has a long-lasting effect, which allows patients not only to achieve a desirable effect after using Lamisil cream for jock itch or similar infectious diseases but also to prevent recontamination after a short period of treatment. Terbinafine specifically inhibits the early stage of the biosynthesis of sterols in the fungal cell membranes. This effect leads to the deficiency of ergosterol and intracellular accumulation of squalene, which causes the death of the fungal cells. Terbinafine acts by inhibiting the squalene epoxidase enzyme in the cell membrane. Since this enzyme does not belong to the cytochrome P450 system, terbinafine does not affect the metabolic pathways of the hormones in the human body. 1 gram of the cream contains terbinafine hydrochloride 10 mg, which is equal to 8.8 mg of terbinafine. Less than 5% of the dose is absorbed after administration of the drug on the affected area of the skin. Therefore, the absorption of terbinafine into the systemic circulation is negligible. 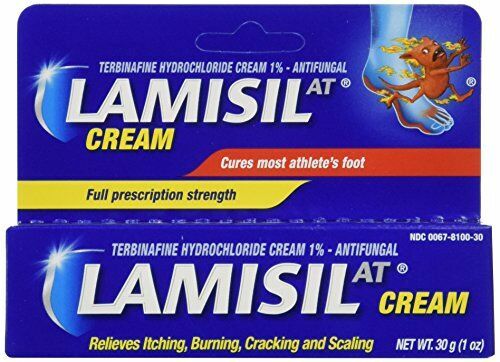 The Lamisil cream should be applied 1–2 times per day depending on the observed seriousness of the infection development. Before applying the cream it is necessary to thoroughly clean and dry the affected areas of the skin. The duration of treatment depends on the severity of the disease. Interdigital toe web infections and/or dermatophyte infections of the torso – the cream should be used one time per day for 1 week. Skin candidiasis – the cream should be used 1-2 times per day for 1 week. Multicolored lichen – the cream should be used 1-2 times per day for 2 weeks. Elderly patients do not require additional dose adjustments. As for the pediatric population, the clinical experience of using the drug in children under 12 years of age is limited, so the drug should not be used to treat this age category of patients. The drug also shows very efficient results in the therapy of yeast infections. Lamisil cream penile yeast infection therapy demonstrates better results in comparison with the therapy with most of the currently prescribed antiseptic agents. The active components of the drug that penetrate deeply into the affected penile tissues and make it possible to cure the disease starting from the inner cellular layers. However, these active ingredients also perfectly fulfill their external functions eliminating pus cells from the tissue, i.e. cleansing the affected area from the external irritant. Lamisil cream for yeast diaper rash should be administered four times per day. If the positive effects are not observed after three days, you should inform the pediatric health care provider in order to find an effective replacement or adjust the daily dose. The cream is intended for external use only. Do not use it in case of the known hypersensitivity to terbinafine or to any of the components of the curative agent. Terbinafine may be found in breast milk. For this reason, the drug cannot be used in breastfeeding women. The notable signs of relief are usually observed in two-three days after the beginning of the therapy. Irregular use or premature discontinuation of the treatment may lead to the reactivation of the infection. If the signs of any notable improvement are not observed after two weeks of the treatment, you should contact your doctor. Additional dose adjustments may be necessary. Local symptoms such as itching, peeling or burning of the skin, pain, and irritation at the site of application, pigmentation, erythema. These minor manifestations should be distinguished from hypersensitivity reactions, including rashes, which may require discontinuation of the treatment. In case of accidental contact with eyes, terbinafine hydrochloride may cause eye irritation. Peptic ulceration and burning sensations. Pain at the site of application. Irritation at the site of application. Seldom reported aggravation of symptoms of the fungal infectious disease.